August 28th marks the 5th anniversary of the unveiling ceremony of the KCBQ monument. It's located along the north side of Mission Gorge Road in the San Diego suburb of Santee, directly in front of an In & Out Burger, which was not there five years ago! The monument features the names of all of the air talents who worked at the station from the 1958 through 1978. 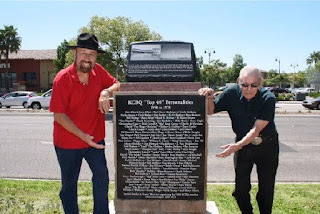 The project was spearheaded by several past employees who wanted the former transmitter and studio site of this legendary radio station commemorated. KCBQ blasted out with 50,000 watts on 1170 AM. Pictured is "Shotgun Tom" Kelly along with 97 year old Jack Vincent, former all night air personality (1955-1968) and the oldest living DJ of the top 40 era! The official KCBQ unveiling video (posted by Bobby Ocean) is on YouTube.